Successfully Added 2.5 Inch HDD Enclosure Media Player - OTG DivX SD MMC to your Shopping Cart. 2.5 Inch IDE external portable hard disk enclosure with media playing capabilities, and featuring a SD/MMC card reader, USB OTG recording direct from USB devices to the hard drive and native movie playing in DIVX format. Store and view all your favorite movies, music or photos with an up to 180GB hard disk and partitions of 30GB. 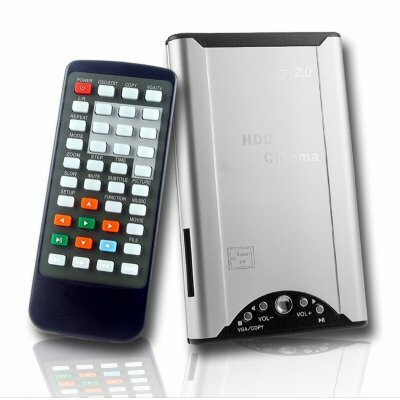 Great features, easy to use OS, and Chinavasions low wholesale price all go a long way towards making this a HDD media player you should be considering adding to you catalogue or having for your own personal use. Hard disk drive (HDD) NOT included, the HDD you use must be formatted correctly for the enclosure to be able to operate..